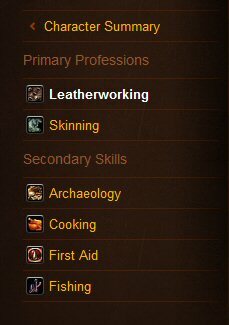 That’s FOURTEEN different paths to consider when rolling a new character: why is then that so many people don’t even bother with Professions at all? I think the biggest single problem with professions as they stand is the same issue that still blights the levelling process from 1-85: the issue of Expansion Fatigue. Every time Blizzard introduces a new expansion the existing systems aren’t properly redesigned, stuff just gets tacked onto the end of them. It’s easy to understand why this has become a problem as the level cap has increased: Blizzard never intended this game to last as long as it has. The systems that were put in place in Vanilla are now frankly inadequate as we approach Expansion #4. Blizzard have admitted that stat inflation is a major issue: however I’m not seeing anyone admit that crafting systems are also suffering and require an overhaul. They REALLY do, Blizzard, and you need to go back to basic principles in the same way as you will with armour. There is a bigger issue to consider, however. You do not want to lose any of the positives that Professions bring to the game, and they do. The 10 Primary Professions all have tangible combat benefits for those who practice them, and it’s time that this benefit was more widely available (and beneficial) to everyone outside the End Game, that levelling with a Profession could be assured as a way to make money and to help in the process. How do we make that happen with a system which, in some cases, is EXACTLY the same as it has been since Vanilla? I’ve isolated five areas I think need to be addressed, and I have ideas on how they could be changed.